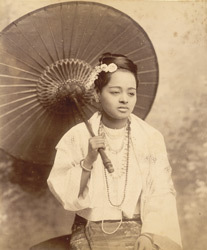 Photograph of a Burmese woman, taken by Watts and Skeen in the 1890s, from the Curzon Collection. In this studio portrait the unknown sitter is dressed in a traditional costume consisting of a woven silk wrap-around skirt known as a hta-mein, with a loose wide-sleeved jacket. She wears flowers in her hair, is richly adorned with jewellery and is posed holding a parasol. The independence and social freedom of Burmese women was remarked on by many European visitors.